There are a lot of these about, by definition. 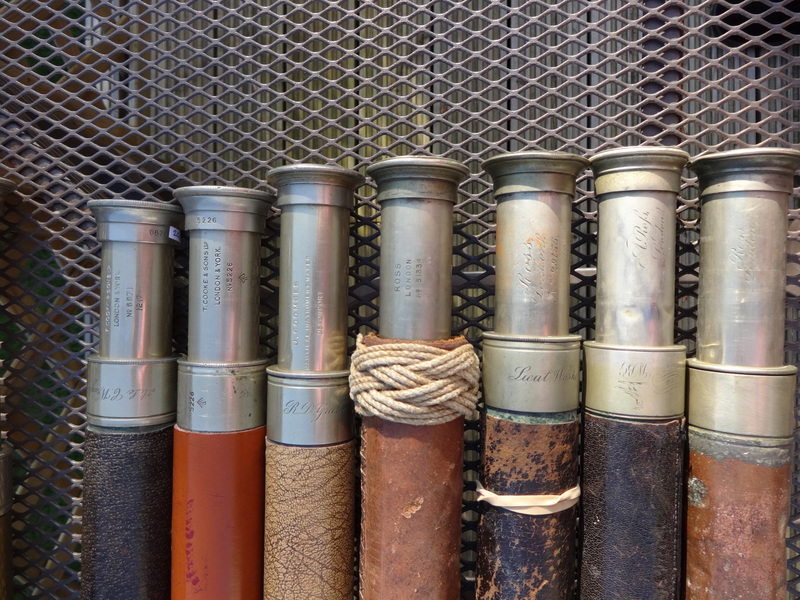 Go onto any warship and there are several of this style of telescope available for use – a prime example is behind the bridge on the Royal yacht “Britannia”, now moored up near Edinburgh, where the hooks/hoops hold about four of them in place. A few years ago I consciously bought some spares for this style, by buying old battered ones on Ebay. 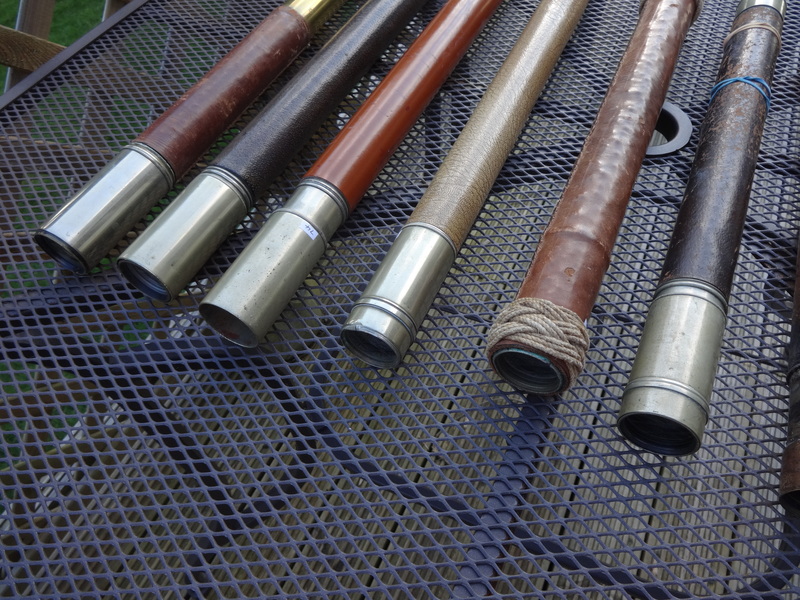 These, plus some better ones, are shown here – ten in total – and the mods illustrate how the basic design can be repaired with old conduit or whatever, as long as the lenses are still intact. One of these examples has been moulded over, such that it cannot be dismantled, but currently it still works! Actually the diameters are not consistent between all these models, so lens swapping is not that simple. The manufacturers shown here are Ross, in many different eras, T. Cooke, Hammersley, and one that looks like a reseller, J. Coombes of Devonport (which latter has a interesting story, being engraved as owned by R D Graham). Actually J Coombes is quoted as an optical and instrument supplier to the Admiralty from the mid 19th Century onwards, so possible he did build the telescope. The quantities in which these were produced are illustrated by the serial numbers on some of the units. For example the T. Cooke models are numbers 5226, and then 6671, labelled on the sunshade, eyepiece, first draw etc. Then the four Ross units show the age progression, starting with one unit engraved as made by A. Rofs of London, in old script, with the “f” typical of late 18th or early 19th Century writing. This one has two crests on the end of the barrel, showing that it was presented by GRJ, with a king and crown image, to WBG, with a dove of peace image. 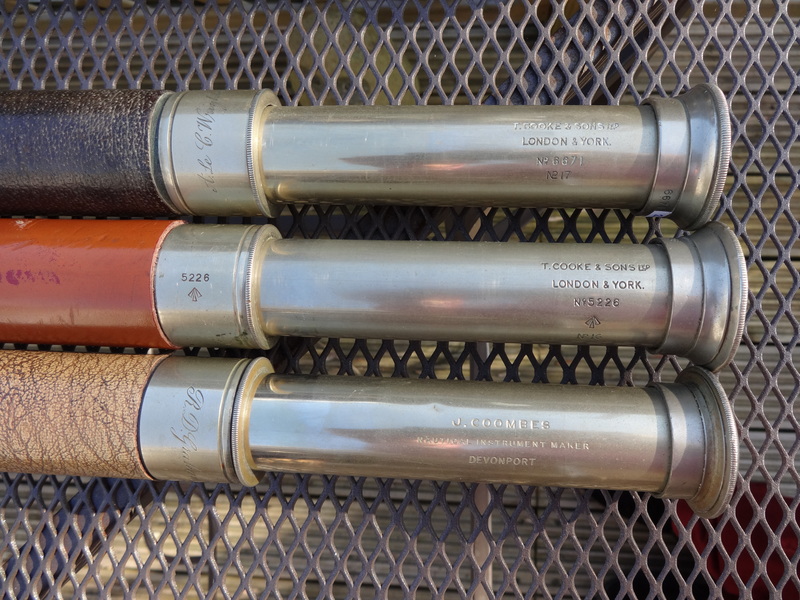 A later unit is engraved in script, with a serial number 29155, and has the name Lieut Washer RNR engraved on the end of the barrel. This one is additionally engraved as sold by Seagrove and Co, of Portsea. There is then the moulded together unit engraved with ROSS in capital letters, and this is given serial number 31334: so there seem to have been a lot of these produced! 31334 has another much more interesting story, which will be recorded separately, as it was owned by Lt Cdr Francis Edmund Blechynden Haselfoot RN, active during WW1. I have actually forgotten to mention the other Ross unit here, bought for spares with no objective lens, although there is a lens somehow mounted half way along the main barrel! The rest of this barrel is really damaged. 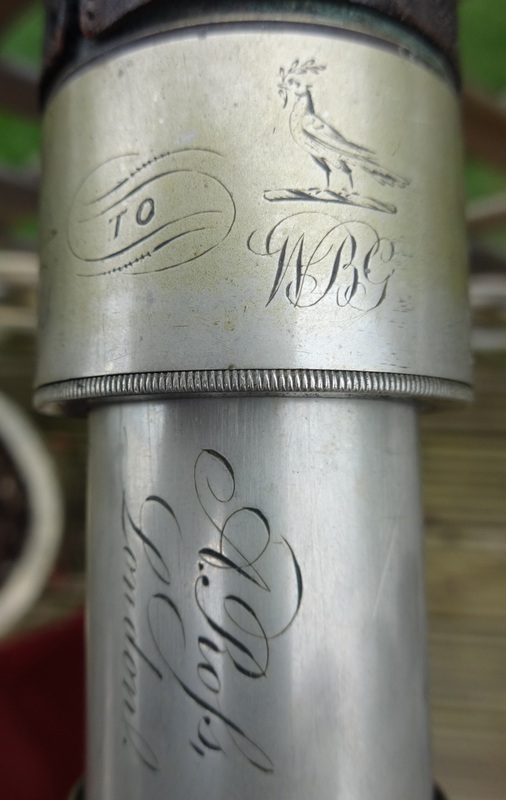 This is engraved as Ross London in script, with no serial number, on the eyepiece draw, so maybe is the second oldest. But actually the bezel has a name engraved on it, which has been almost totally wiped out with polishing. Again the name has a symbol above, maybe a tree branch around a bird again, similar to the one quoted above. After polishing and study it looks like the two words underneath could be Murray Gladstone. Andrew Ross worked mainly in Clerkenwell from 1830-1859: Ross & Co was used as the company name when they moved to Piccadilly, between 1839-1842. After 1859 Thomas Ross continued the business. The typical design is for a 17” or 18” long barrel, with a 6” single draw to the eyepiece and approx a 1.5” objective lens. Typically the sunshade pulls out around 3”. The barrel is usually leather covered, but when that wears out it would get covered with whatever is available. One of the examples pictured seems to be half covered in leather, and half brass polished. These scopes are easy to focus, easy to use, short enough not to hit anyone else or get in the way of colleagues on a small bridge, give a reasonable magnification, and are fit for purpose – ie use by the Officer of the Watch. Most of them seem to have been personalised, so maybe were purchased by the Officers themselves. * R D Graham was a single handed yachtsman sailing the Atlantic in the 1930s. See a later story. * Lieut Washer was in the RNR, Royal Naval Reserve, presumably in WW2, but I have not located him as yet. * Lt Cdr Francis Edmund Blechynden Haselfoot RN commanded a ship in the North Sea in WW1. See a later story. * The Cooke telescope 6671 was owned by Acting Lieutenant C Wright. So these are all naval, or at least, associated with use at sea. There are two more that bear markings, and are interesting. There are some parallels to the one above, with this further Ross telescope. We assume it is later than the one quoted above. It was bought for spares, with a barrel that is badly squashed and bashed about. But only in writing this have I noticed the engraving on the bezel. This is almost totally worn away, from frequent polishing, but the wording underneath has eventually been deciphered as Murray Gladstone. Above this name there is an image framed in an olive branch almost making a total frame (from 7pm to 5pm on a clock face) around what could be a bird, but this time on a mound or mountain. This is very indistinct. (Having taken the photo shown on the left, and studied it, the image could be of a woman in a dress – the skirts making the ‘mountain’ – or even an angel with wings behind). Now I did not know about Murray Gladstone before reading the name on this telescope. Google advises that he was, in fact, the first cousin of the British PM William E Gladstone, and he built a country mansion near Penmaenmawr in Wales, according to the Penmaenmawr Historical Society (thanks to David Bathers and Dennis Roberts). It cost him what would be £1m in today’s money: the house is today called Noddfa, which means a place of refuge and peace, but then was called Tan y Foel. Murray Gladstone was a Manchester businessman who made his fortune in the Anglo-Indian textile trade. Tan y Foel was built as a country home with tennis courts, a nearby golf course and elegant gardens overlooking Liverpool Bay. He died tragically on the beach on Monday night the 23 August 1875. He allegedly suffocated in the shallow water after slipping off the rocks. It is alleged he had a few enemies in the locality, so maybe this is another mystery on the shores of Penmaenmawr: did he fall or was he killed? It would have been a real coincidence had the A.Rofs telescope quoted first actually have been given to W.E.Gladstone! What are OOW telescopes worth? It all depends on how much action they have seen, in more ways than one. If one has seen a lot of action, been dropped on the rocks or in the sea, or blown to pieces, it is not worth a lot. If it is in perfect condition, and works, and has no name, it will be worth £120-150. If it has a past owner that is recorded, maybe via an engraved owner’s name, and has possibly been associated with past events, it is worth more: and T. Cooke versions are better quality than the others. 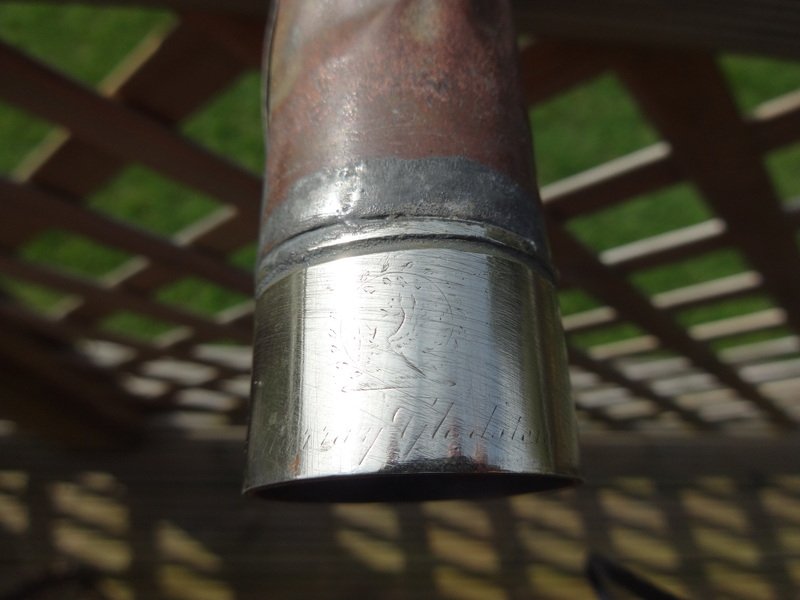 If you actually can find out what the owner did, who he was, and maybe whether the telescope was associated with his activities, then it is worth much more still, maybe £500 plus. 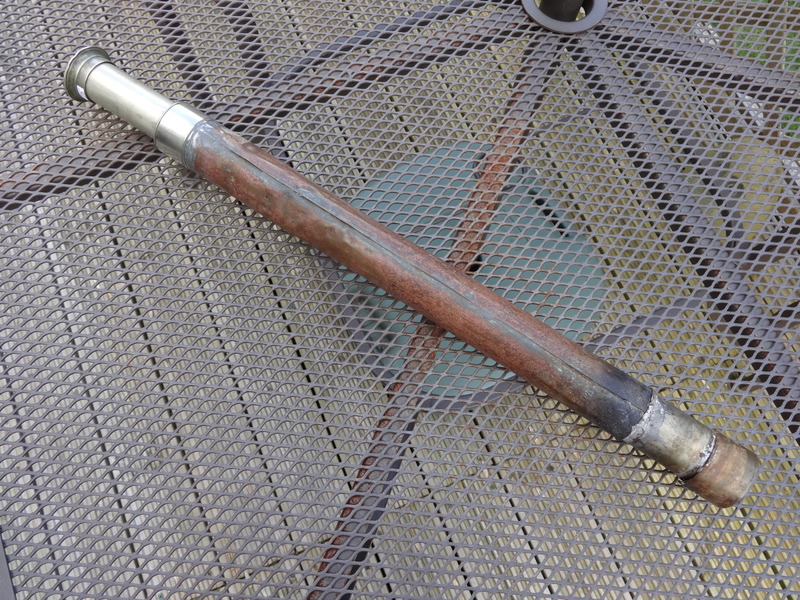 Sadly I cannot see the Ross telescope from Murray Gladstone ever being worth a premium, and it will never work again: but it only cost me £10, plus postage. One of the eyepiece lenses is already in use on a T. Cooke model, serial 5226, one of the others quoted above! This is a time warp telescope. The design is of the type you might expect to see from Troughton and Simms, or Negretti and Zambra, or Dollond, around the turn of the Century – that is, going into the 20th Century, around 1900. 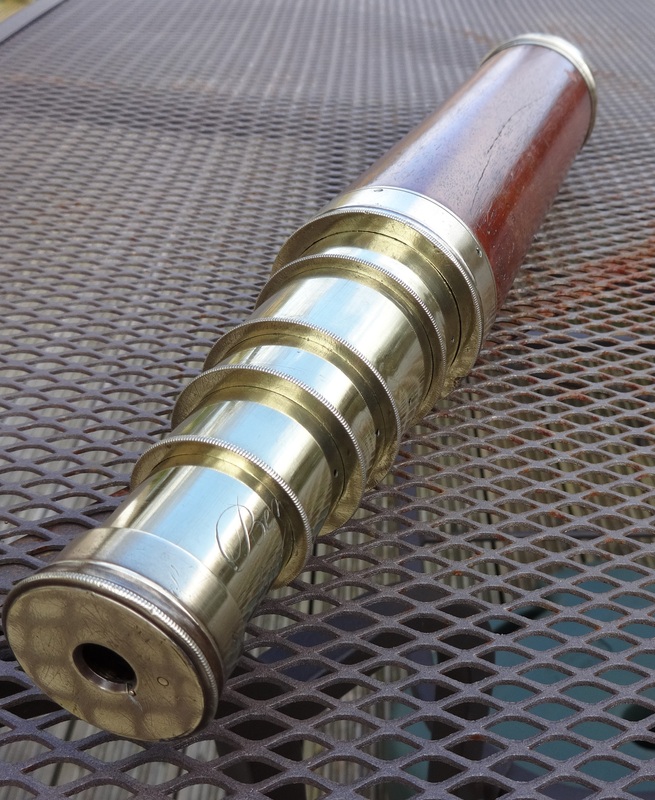 What makes this one really unusual, is that it dates from the end of the 19th Century, around 1800, when the majority of telescopes, if of this size, were of the long wooden barrel design with a single draw. If they were three or four draw brass units, they were not as big, i.e. they were smaller in diameter and shorter (see the examples quoted on this site from Jesse Ramsden). What makes this one different is that it comes from “Berge, late Ramsden”. Jesse Ramsden was arguably the best telescope maker in the 18th Century, and while he did not invent the Dollond patented dual element objective lens, he did have enough common sense to marry Peter Dollond’s sister, Sarah, so presumably had a good relationship with Peter. While Ramsden worked in the period 1760-1800, Matthew Berge worked for him during that time, not as an apprentice but as a skilled employee, and became his natural successor: when Ramsden retired to Brighton due to ill health, Berge ran the business. When Ramsden died, in 1800 Berge took over, styling himself as “Berge, Late Ramsden”. He worked under his own name from 1802 to 1817, in London, at 199 Piccadilly, so possibly the transition period 1800-1802 was a period where he might have styled himself as ‘Berge, late Ramsden’, but this is just a guess at a narrowed time zone. What makes this telescope really different? It is the care and thought behind the engineering design. 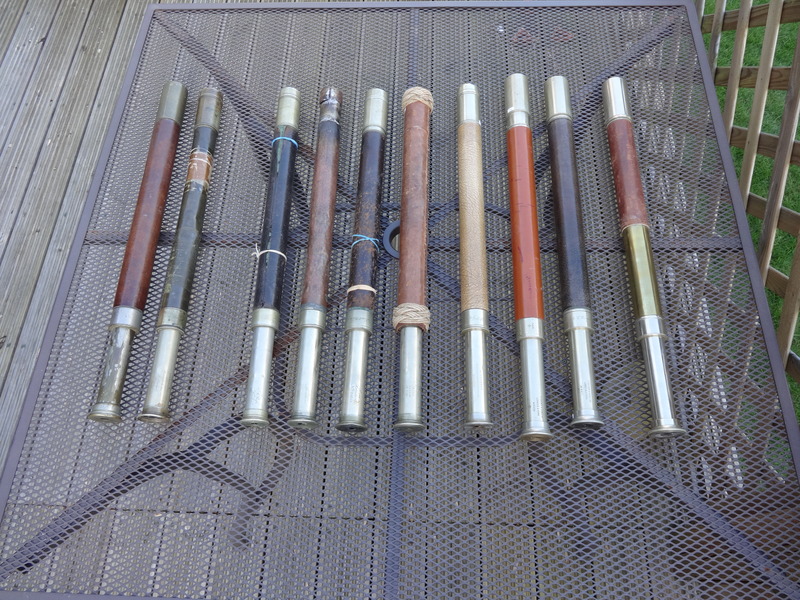 Added on top of a five draw construction, each 6” long, which was very advanced for the time. Each draw has an overlap and mounting sleeve to the larger one behind of about 2”, which gives the draws stability, holding the optical axis solid. This is also helped by the small differences in diameters of the draws. 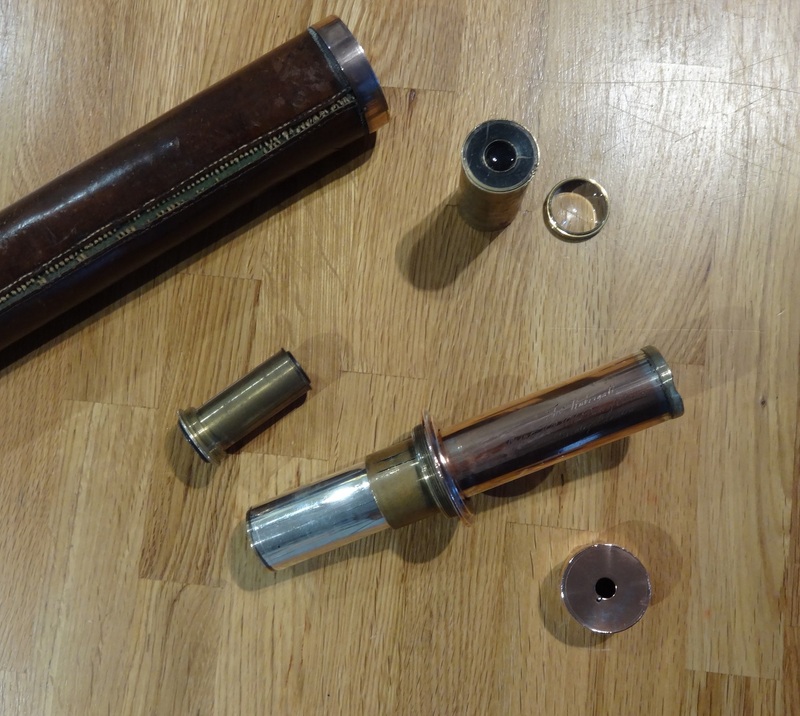 The only failure is in the first draw, where there is some play evident, mainly because the diameter difference is larger to allow the lens assembly to be screwed in with a knurled ring at the end, obviously the knurled ring diameter could have been bigger. Then each draw has an air eject hole, to equalise pressure when closing or opening the scope. Other telescopes have done this, but this telescope in addition has a location arrow that enables each draw to be positioned consistently in the original orientation when the scope is opened, just in case there is a difference when the lenses are rotated with respect to one another. These marks are visible on the photo here. The telescope is very long – you can’t hold the wood when looking through it, the stretch is too far. So it needs a ship’s rigging to hold it in place maybe. But also this might explain why the wooden barrel is relatively bashed about: the wood is only around 4mm thick, and in restoring it to operation there were about 5 or 6 longitudinal splits that had to be glued back together. The wood is also very brittle, after 200 years! The objective assembly has been pulled out of the wooden barrel, by damage or dropping it, several times, and I have yet to drill new holes for the grub screws. What’s missing? What was it used for? The telescope has an eyepiece flap cover, but no objective lens cap. It is designed to take the latter, but it has obviously got lost. Probably over the side of a ship. It was probably intended for high magnification, long range use on a ship at sea: it is too heavy and long for use on a country estate, or on a horse, in the cavalry. It cannot focus on relatively close objects, which would need the eyepiece pulled back further than it can travel, so would not appeal to a man on a country estate looking at birds or foxes etc. There are no owner’s marks to give any clues as to who used it. A different view on the telescope and its modern associations is given on the other story about iPad lenses, see https://telescopecollector.wordpress.com/2013/12/27/liquid-lenses-for-ipads-and-mobile-phones/. It came from an Ebay auction, but I don’t really remember how long ago and for how much. Maybe it was in 2012, and maybe it cost £120-150, because that is about my normal limit – obviously no-one else saw it on Ebay or I would not have won it. The diameter is 2.125”, and overall length 42” open, 10.25” closed. I have numbered it as #203. It was bought because it is a really big scope, by a really good maker, in good condition. 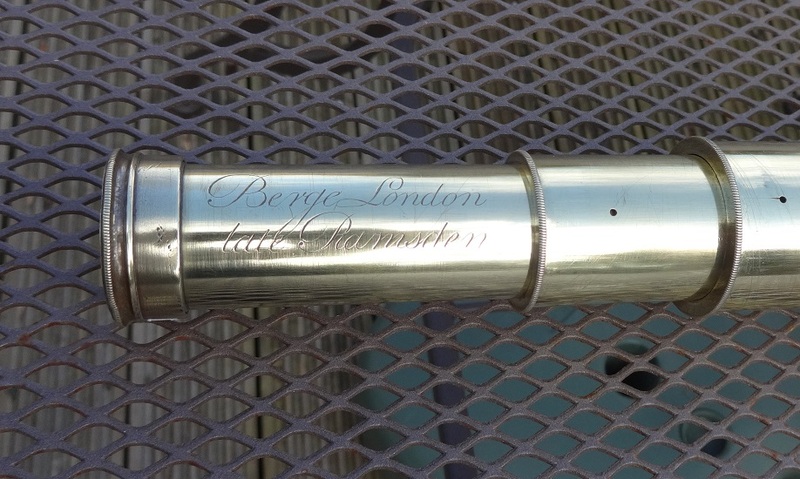 It has two style characteristics of late 1700/early 1800 telescopes: (1) a flat eyepiece construction, and (2) the engraving is on the right hand side of the first draw, ie, the B of Berge is closest to the eyepiece end. This changed in 1810-1820 latest. 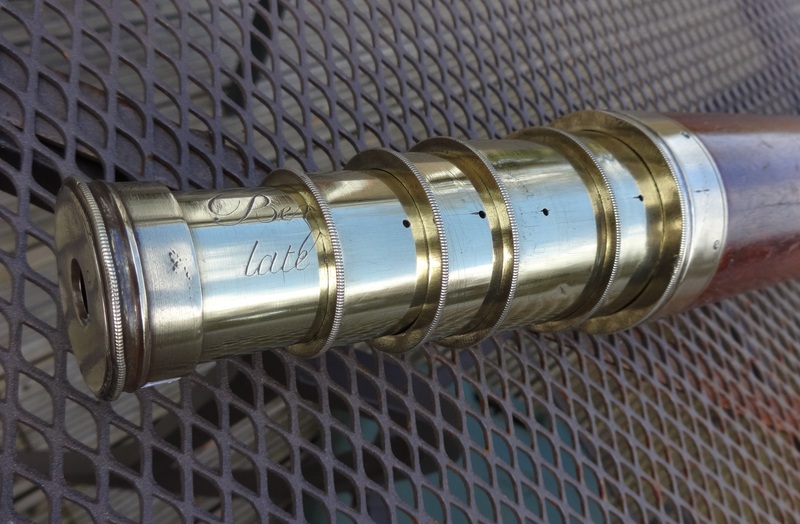 Renovation involved polishing the brass, gluing up the cracked barrel, and also reseating the five grub screws in the brass objective assembly, which had all been pushed out of the wood. When screwed down, in fact, the draw nearest the barrel actually hits these grub screws, pushing them out of the mahogany. Just a slight hiccup there…. This telescope almost poses more questions than it answers! But it is really beautiful, and easy to use, despite the length! 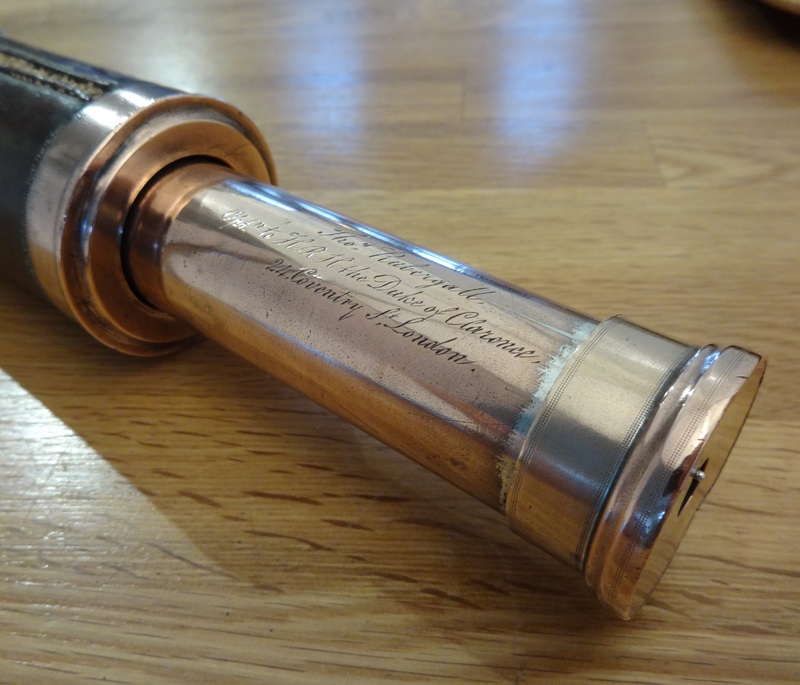 Unfortunately, the engraving on this telescope does not mean that it was owned by the Duke of Clarence (later to become William IV), it just says that Thomas Rubergall in his professional business had been an appointed “Optician to H.R.H. the Duke of Clarence”. Actually, the address then quoted underneath is 24 Coventry Street, London, a location that Gloria Clifton’s book suggests he moved into in 1840, through to 1851. Rubergall had in fact been making optical instruments etc since 1800, but by 1805 he had moved to prestigious premises, in different premises in Coventry Street. William, the youngest son of George III, was appointed Duke of Clarence in 1789, when he was aged 24 and became active in the Royal Navy, mainly in the Caribbean. Effectively the Dukedom ceased when William was crowned William IV in 1830: he then died in 1837, aged 72. But Rubergall had kept his patronage after the Coronation, as he was listed as an appointed supplier to William IV. 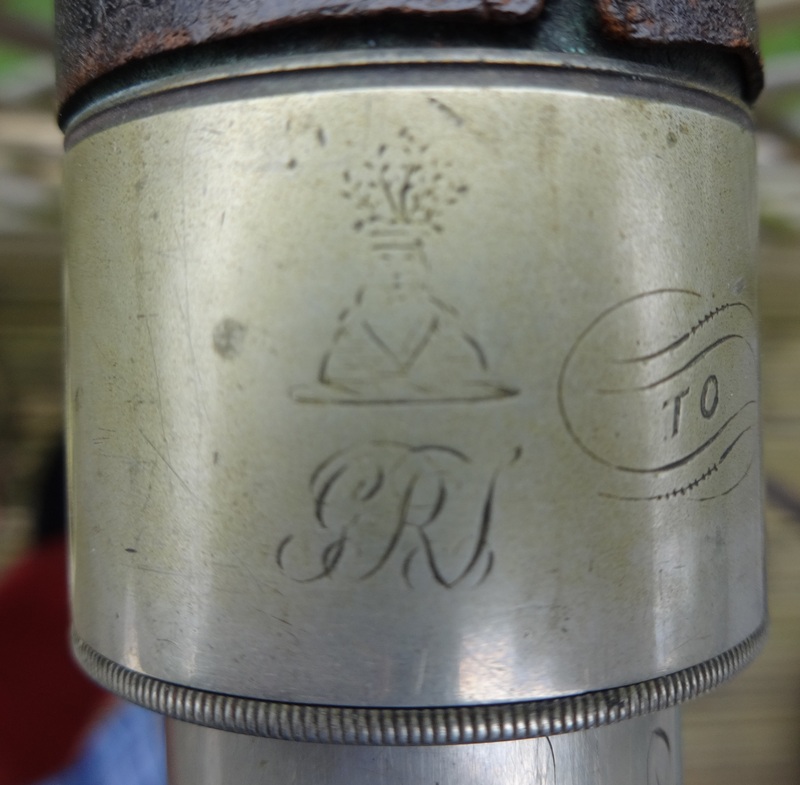 So the words on the telescope introduce some confusion as to when it was created – the answer must be “around 1830”. The Duke was an enthusiastic sailor, and was commanding Royal Naval ships from 1786, under Lord Nelson. He left the Royal Navy in 1790, and was annoyed that he was never asked to take command again in the naval battles of around 1800. Eventually, he was made Lord High Admiral of the fleet from 1827-28, when he was asked to step down after taking a squadron out to sea for 10 days without having notified anyone as to what he was doing or where he was going. His nickname as William IV was “The Sailor King”. 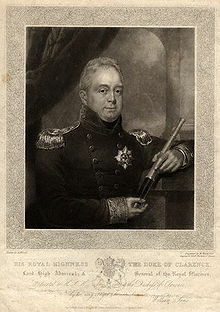 The copy of the print by William James Ward here shows him as Lord High Admiral, with a telescope, but not this style! His personal life was a little complicated, having fathered ten illegitimate children with an Irish actress called Dorothea Jordan, with whom he cohabited from 1791 to 1811. The telescope itself is a single (short) draw style, with a leather clad brass body. 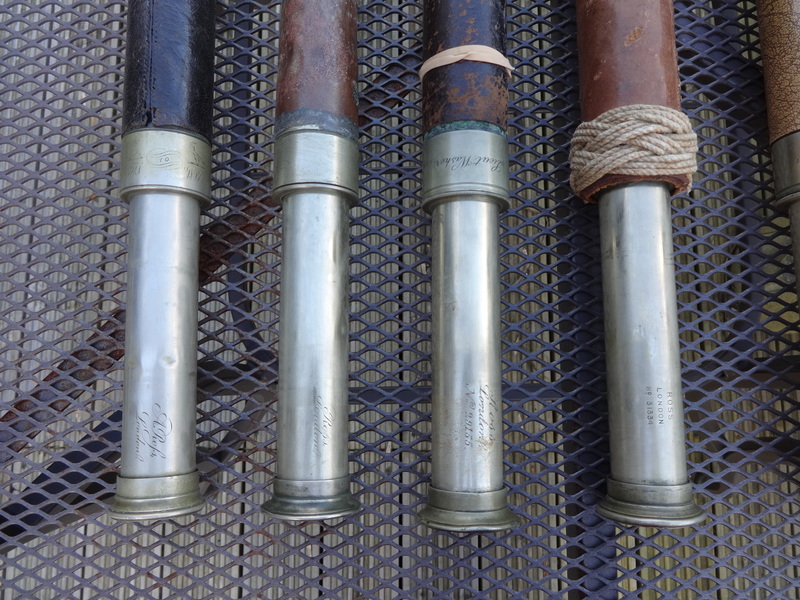 The external metal fittings at each end are copper or bronze, with the actual threaded parts mainly in brass – most of these threads still work perfectly. All the copper/bronze parts were at one time silver plated: maybe with enthusiastic cleaning over 200 years by servants in a prestigious house, all the plating has worn away on normally exposed surfaces. Notably the screws holding the bezels at each end of the main barrel are original and tiny. The construction inside is a standard approach of five lenses, one objective which is a two element lens, and two cartridges at either end of the single draw, each containing two lenses. Diameter max is 1.875”, the length is 25” open, 19.5” closed. Magnification is not that great, maybe 10x or 12x. Possibly the telescope was as much to assist poor eyesight as to supply a magnified detailed image. It is certainly intended for naval use, in my view, just from the design and size. The main use is to show itself off as a high quality expensive instrument, hence the size, both length and diameter, good leather, and silver plated metal fittings, with the royal appointment quotation in ‘copper plate’ writing near the eyepiece. Given that, it was surprising there was no owner’s name or mark evident: it was at this point that I found a crest and name embossed onto the leather of the barrel, half way down, on the opposite side to the stitching. 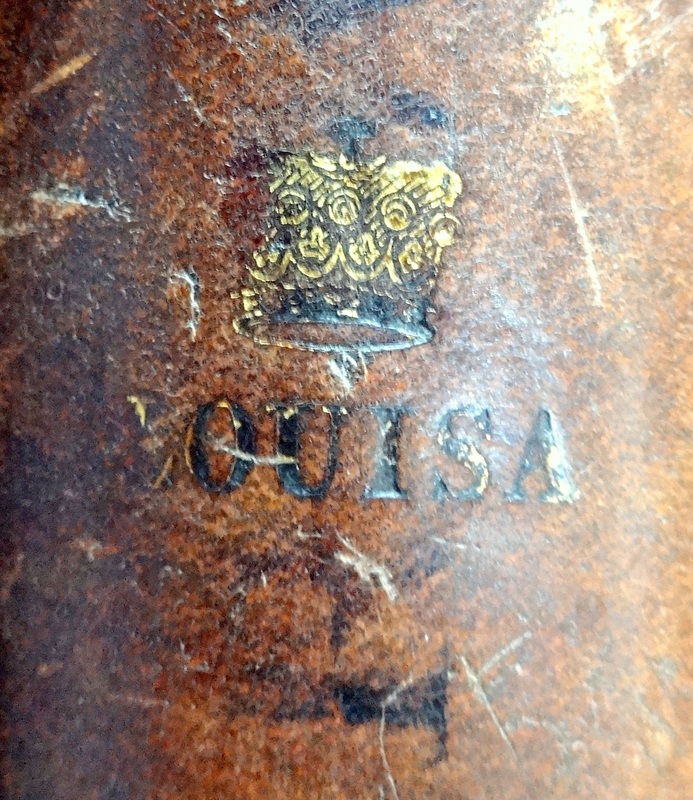 It can just be read as “Louisa”, with a crown above it. The Crown is gilded, and the name at one time was also picked out with gold letters. At least between 1829 and 1831, Lord Belfast owned a 129 ton yacht, a racing cutter, called ‘Louisa’, and this is referred to in the Royal Lymington Yacht Club’s archives of history. Their interest was because a racing cutter called “Alarm”, of around 200 tons, one of the largest of its type, was built at Lymington (Inman’s Yard). Alarm beat Lord Belfast’s Louisa in the 1831 King’s Cup Race, but lost a 1000 Guinea match race to Louisa later that year: then Lord Belfast acquired a new yacht in 1833, “Waterwitch”, for future races. What happened to ‘Louisa’ is unknown, he tried to sell it to the Navy. 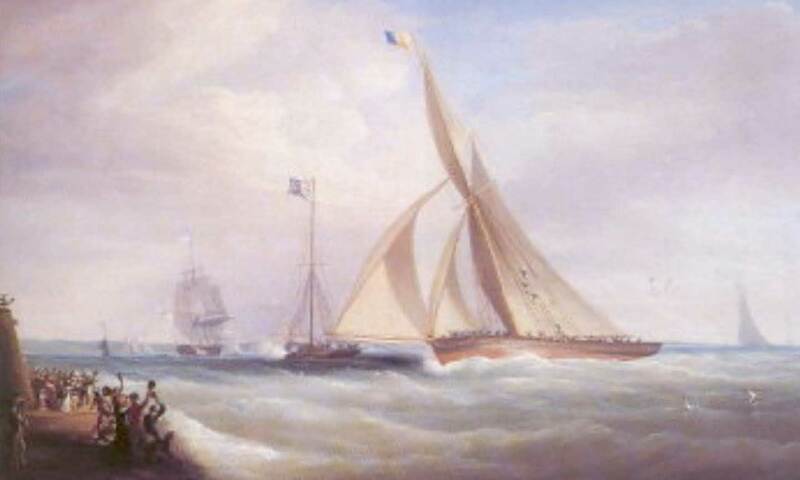 The picture shows the ‘Alarm’ winning the 1831 race ahead of ‘Louisa’. 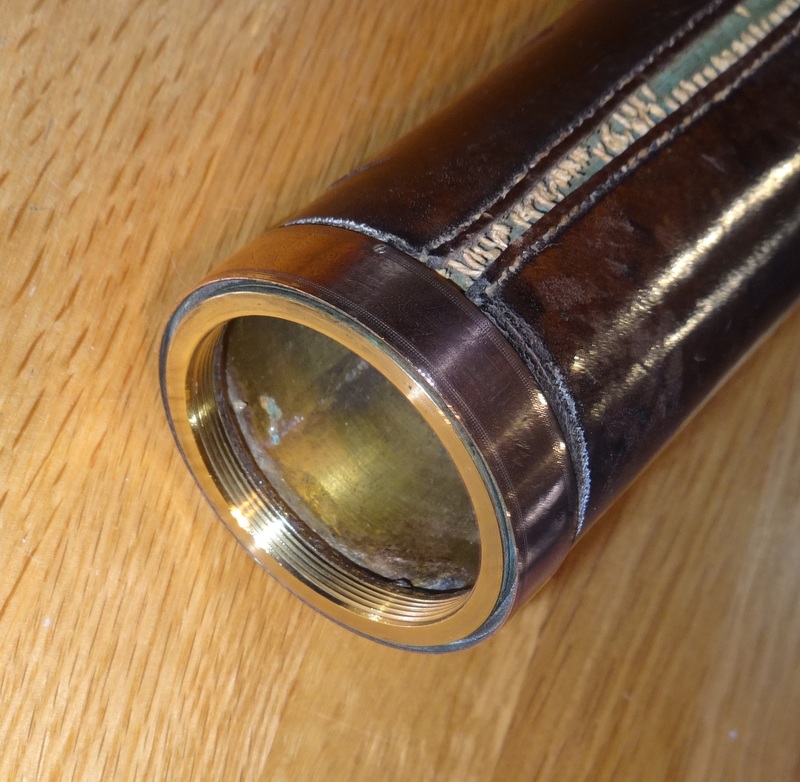 It seems likely this telescope was in use aboard Lord Belfast’s Louisa in around 1830-32, adding some further information about the date. Possibly Gloria Clifton’s book has is not right about the date of moving operations to #24, and it was earlier? The Science museum website suggests he traded from 24 Coventry Street from 1826 onwards, which would solve the problem! Size: 1.875” diameter, 25” long fully open, 19.5” closed. Condition – and how well was it made? Externally it looks well made, and it still works properly, everything screws up properly, but the one criticism might be that the retention of the single draw in the bezel at the eyepiece end of the barrel is not strong enough – it may just be that the internal slider has been damaged inside, where a break in the brass is visible, but the outer diameter of the draw is a little too small for the hole it goes through. Despite layers of soft felting in there to make the draw smooth, the joint still wobbles a little too much, which can make the image seen through the telescope move around a little. Later versions of telescopes have a two point suspension, by moving the thread away from the outer end of the bezel, giving less room for a lateral wobble at this point. The leather is original, but the longitudinal stitching is splitting, and I can’t see an easy way of repairing that. It has lasted nearly 200 years around a copper alloy metal barrel, which has some green oxide from the effects of seawater spray, so it has served its time. The objective lenses themselves will not unscrew from the end assembly, so I cannot really confirm that the lens is just a doublet: presumably this is from bangs on the end, since the glass is right at the extremity, and could easily be damaged or the housing knocked. There was undoubtedly a lens cap on here at some time, certainly when it was made, but this is missing. That depends on how impressed any purchaser might be with the pedigree! I bought this telescope on Ebay in November 2003, and bid as much as what I thought it was worth, and that I could afford. I vaguely remember that there were two significantly higher bidders, but eventually the seller contacted me to see if I would still be willing to pay my bid, as the other two had retracted their bids, or changed their minds! When it arrived I too was a little concerned at the state of it, but it cleaned up quite well, and has become quite interesting as more has been discovered – even today! 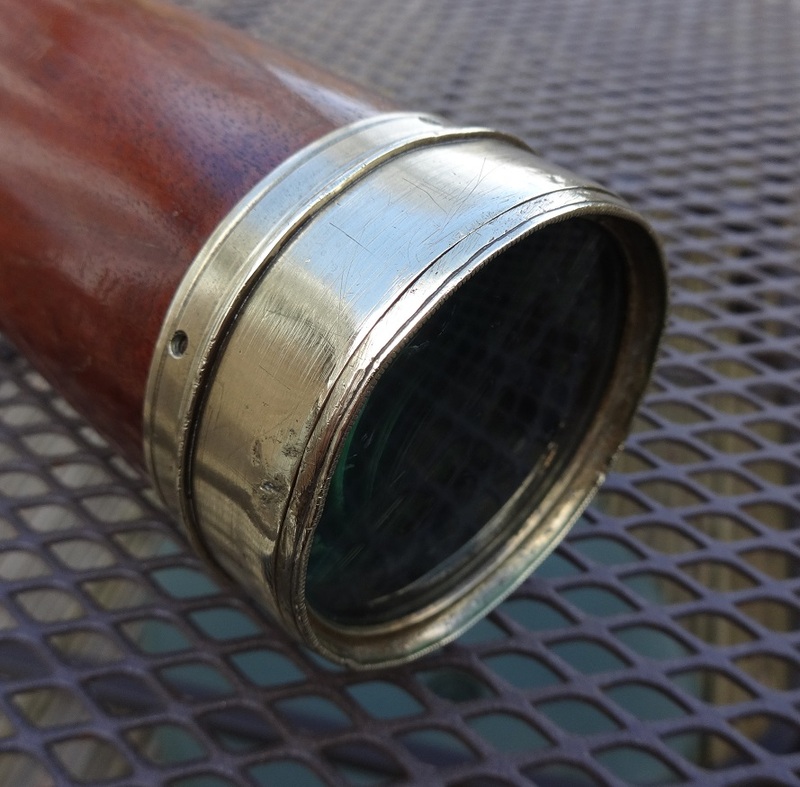 A purchaser at the Royal Lymington Yacht Club, or any other similar or associated yacht club, would maybe appreciate this telescope for this history, and it would be worth the £1500 they would need to pay! It is now time to sell this one to somewhere it will be appreciated.